Hello my name is Sophia and I run PetStay Norfolk. Ever since watching James Herriot on the tv and reading all his books, I have wanted to be a vet. After graduating as a veterinary surgeon and working as a vet for a few years I started a family with my husband and found I couldn’t really combine being a vet with family life. I started teaching Animal Management at the local college and achieved my teaching degree after 2 years. This was a great combination, I still had a job where I could take my dog to work (Seamus, on the picture) but when the children were off school, I was home as well. 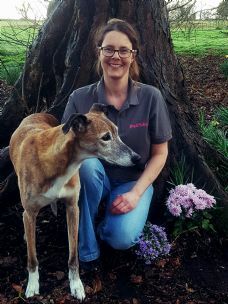 After 7 years of teaching it was time for a change, I was looking for a job where I could combine my love for dogs with my organisational skills and when I saw that PetStay Norfolk was available, I jumped at the chance to take it on. All our carers' homes comply to the new regulations with enclosed gardens and systems in place to prevent a dog escaping from the front door. We match our carers to your dog to ensure that your four legged friend can go to the most suitable carer. If they are used to sleeping on the bed, we will match them up with a carer that will do the same. All dogs will be walked according to your normal routines. Our carers take enough information to be able to replicate your normal routines as close as possible. Each carer lives in an area with lovely walking places. Daily fee: 1 dog: £21.50, 2 dogs: £32, 3 dogs: £42. A non refundable deposit is paid within 5 days after meeting your carer, preferably by bank transfer. We have carers all over Norfolk, after matching your dog with the most suitable carer, we will give you the corresponding address.